Looks like a disaster waiting to happen having seen the footage on the 1pm news. They left it too late so now it's being bodged. I wouldn't stay in their athletes' accommodation if I was backpacking on a tight budget. Dyssentry guaranteed, sink coming off the wall highly likely, collapse and death possible. Rather than waste it though we should let them have the 2012 Olympics. Isn't it time to scrap the Commonwealth Games though? It's like the World Student Games, unless they're actually related to a competitor nobody gives a monkey's about it. Delhi police spokesman Rajan Bhagat told AFP news agency: "There is no need to panic and the pictures on TV make it look much worse than it is." I love the Indian sense of optimism. Genius. What with the "accomodation unfit for human habitation" and the stadium footbridge collapsing, it looks like the Commonwealth games is turning into a bit of a farce. Still, at least it is lowering expectations ready for our London 2012 Olympics. Loved the bit where they said conditions were filthy and unhygienic.You wouldn't expect that in India, would you? "Dem white atletes don no theys born!" Sounds like about 90% of India isn't fit for human habitation by the metrics of these foreign officials. I would have though that designing a simple bridge is far from rocket science. Despite the claim that the collapse is a minor hiccup, this is a big deal. Can you imagine if it had collapsed during the games with punters streaming across it? This would never happen in the west, the Designer will have given assurances that all load factors will be carefully considered, detailed finite element analysis will be undertaken to confirm stability, and in order to keep design costs down, the detailing will be outsourced to India …… oh, wait! 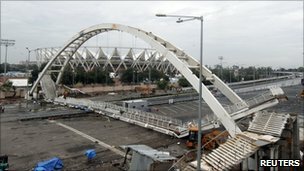 Probably isn't - but the foundations may be made from sun-dried cowshit bricks - hence steel bridge collapses in one section. Who built the bridge and who built the stadium ? If it was the same company ? I certainly wouldn't be setting foot inside it after seeing this. In particular there is now an outbreak of dengue fever across Delhi, caused by incomplete digging of holes across town to accomodate scenic pot plants - another half finished project. The whole games are ridden with corruption (dodgy cement and building standards used in building, etc). I was in India recently (working with crappy IT outsourcers such as Wipro) and the allegations of corruption were front page news then, and not a surprise. Looks like they've cocked up the CWG - not a surprise to any India watchers. They don't do things properly over there - bunch of corrupt cowboys. "Everyone has different standards about cleanliness. The Westerners have different standards, we have different standards," he said. I hope you did something about that, scumbags like that need to be kept in their place (nb - before anybody assumes anything I worked with several highly cultured Indians in London who would be as disgusted by that as any Brit). He said: "They're filthy. They need a deep clean. There's builders' dust and rubble in doorways, shower doors the wrong way round, toilets that don't work. There is excrement in places it shouldn't be. It's uninhabitable." But organising committee chief Lalit Bhanot blamed Westerners' "different standards on cleanliness" and claimed: "The village is probably one of the best ever." A recent report by India's top anti-corruption body found a host of problems with construction work, including dubious contracts and use of poor quality materials. Commonwealth Games Federation president Mike Fennell admitted yesterday: "It's the biggest crisis in the Games' history." A spokesman for the 371-strong England team said their accommodation wasn't up to scratch - but insisted they are "optimistic" that they will still participate. But a Scottish team official claimed: "We have grave concerns. The Delhi organising committee are running out of time." Several athletes have pulled out - including three of England's defending champions: triple jumper Phillips Idowu, 400m runner Christine Ohuruogu and 1,500m star Lisa Dobriskey. The women pulled out saying they were injured, but dad-of-two Idowu, 31, said: "I have children to think about. My safety is more important to them than a medal." Heptathlete Kelly Sotherton, 33, had already opted not to defend her title as well as team-mate Jessica Ennis, 24. Jamaican sprint sensation Usain Bolt, 24, and Aussie discus star Dani Samuels, 22 are also giving the Games a miss. Kelly said: "I'm relieved I'm not going. It's enough to worry about performing but worrying where you sleep and walk is another thing." Sadly Indian preparations will rightly be blamed for this but it shouldn't be allowed to influence the probity of the event. These games are probably the last vestige of empire and indeed used to be called the empire games. They still represent a significant coming together of Nations and that should not be discounted. They should go ahead if only to justify the Millions that have been spent badly on the preparation. Prima Donna athletes that refuse to go reference the standard of their accommodation should never again be allowed to compete for their Countries. Hotels can be used where village accommodation is really uninhabitable. Do we think the army gets 5 star accommodation in the sandpits we expect them to operate in? In my time some years ago I spent weeks sleeping on the floor of a working abattoir and concrete manufacturing plant in Germany as well as a hole in the ground. Part of the roof in the weightlifting arena just collapsed. "Westerners have different standards of cleanliness,"? It's a shame that playing the race card isn't a sport because India might actually win a medal for once. For anyone who has had to deal with the aftermath of an IT offshoring project that "went bad", this stuff is not a surprise. Serious, world class athletes (the sort who can win medals in Olympics) have to take incredible care of their health. An infection that wouldnt mean much to you or me could f8ck up their whole season, and thus a good bit of their career. then there is serious stuff like Dengue being talked about. That could put a damper on your whole life. You're sounding a little like a Monty Python Yorkshireman, mate. I wouldn't fancy setting foot inside any of these hastily constructed places. That's 2 collapses in 2 days. What happens if one of the main stadiums has a collapse with tens of thousands of people inside it ? Its a 3rd world country for gods sake. few success stories are call centres, software outsourcing outlets & garments factories providing cheap labour coutrsey of globalsation rest of it is still piss poor & starving. It shouldn't have been there on the first place. cancel & pull out, I say, before someone dies or else. As I said Hotel accommodation can be made available where places in the village are unsuitable. There is no evidence of Dengue Fever at this stage it is simply the journo's speculating. They may as well add in cholera but of course you can be inoculated against that. In fact when I visited India some years ago a whole clutch of vaccinations were mandatory anyway cholera and yellow fever were two I can remember but there were others. Yes that bridge collapsing is worrying but it shouldn't be viewed in the same light as a section of suspended ceiling panel inside the weightlifting stadium falling. No doubt the layout and lighting (for TV) requirements of that hall required a suspended ceiling to be installed. In the main these are lightweight panel structures. Yes the Indian Government needs to issue a statement guaranteeing the quality of the stadium and other venues construction.